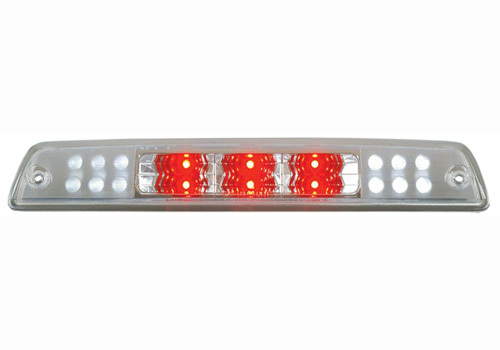 Anzo Clear LED Third Brake Light 02-08 Dodge Ram Anzo Clear LED Third Brake Light 02-08 Dodge Ram, Anzo USA 531070 3rd Brake Light, 02-08 Dodge Ram 3rd Brake Light, 02-08 Dodge Ram LED 3rd Brake Light, 02-08 Dodge Ram Clear LED 3rd Brake Light, 02-08 Dodge Ram Clear 3rd Brake Light,Dodge Ram Brake Light [Anzo USA 531070 3rd Brake Light] - $89.95 : 3rd Strike Performance, Your Source for Late Model MOPAR Performance Parts and Accessories! The most effective way to improve the overall aesthetic of your Dodge Ram is often not to alter a single, expensive element of its design, but to alter a variety of smaller, inexpensive ones. These Anzo USA Third Brake Light replacement models are a great way to do just that. They are an easy assembly, low cost item that, when combined with other items, can subtly distinguish your Ram on the road against others that are using gimmicky, overly garish accessories. Compared to standard OEM lighting, Anzo USA products use less power, are much brighter and have a longer lifespan. Weather tight, precision-engineered and FMVSS-approved, these 100% street legal Anzo third brake lights replace your existing factory OEM lights and arrive with a complete assembly kit. Anzo USA works hard to bring innovative and trend setting looks and designs to the automotive enthusiast. Upgrade your lighting while adding a hint of style and class. Select a simple, low-cost addition to your Dodge Ram that can help distinguish your vehicle when combined with any other product.